Thousands of teachers all over the world already use and teach mind mapping in their classrooms. 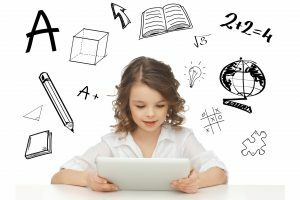 As one of the most effective learning techniques, mind mapping can help students take better notes, improve comprehension, and foster creativity. If you’re interested in using mind maps with your students but aren’t sure how to get started, this article is for you. We’ve prepared 4 simple exercises that you can do with MindMeister, our online mind mapping tool. All of these exercises can be done with very little preparation on your part—all you need is a MindMeister account and some basic mind mapping skills. It’s the beginning of November, which means that you’ve probably had about two months of school by now. This is the perfect time to do a first quick review of what was discussed so far, in order to deepen students’ understanding of the material and help them memorize it long-term. 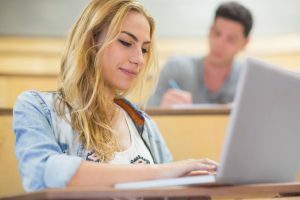 One of the most effective learning techniques is distributed practice, that is, repeatedly practicing what is learned over time, as opposed to memorizing everything in one single cramming session before the exam. 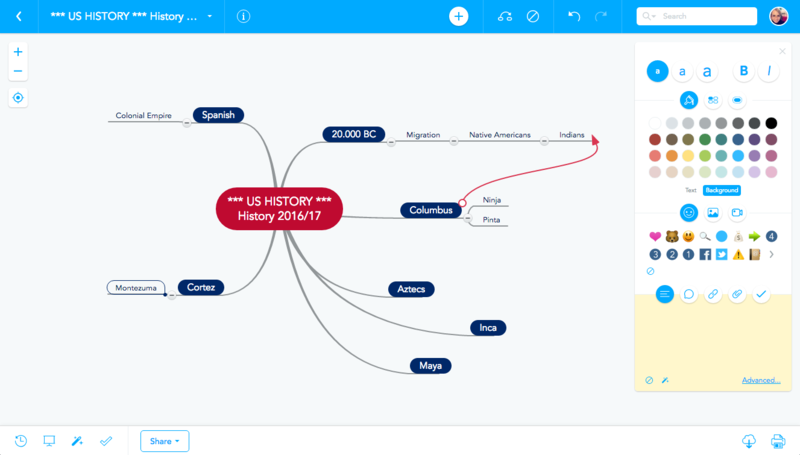 At the beginning of class, ask your students to open a new, blank mind map in MindMeister and write your subject and the year in the center of the map. If you’re covering a specific theme or subject area this year, they can write that in the center topic as well. 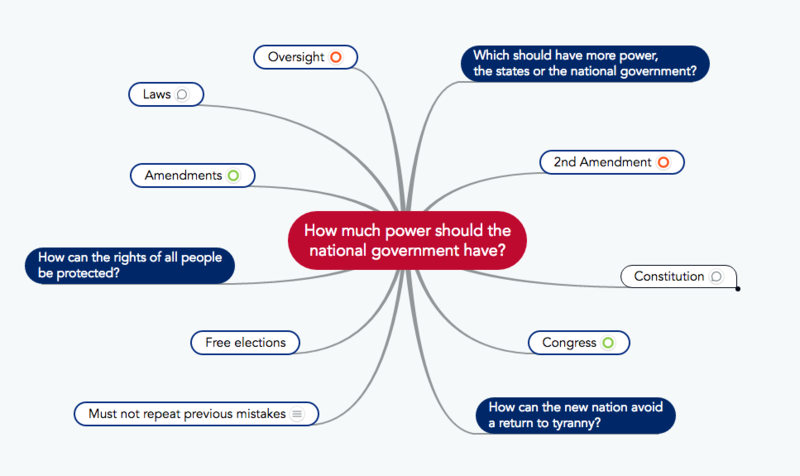 Now, give students 5 minutes to create a mind map about the material you’ve covered so far. The structure of the map is not important at this point, instead, students should do a kind of ‘brain-dump‘ where they let their thoughts flow freely and simply note down anything they can remember. When the 5 minutes are over, project your own version of the mind map onto the screen. You can either prepare it up front or create the map live in front of the students’ eyes. 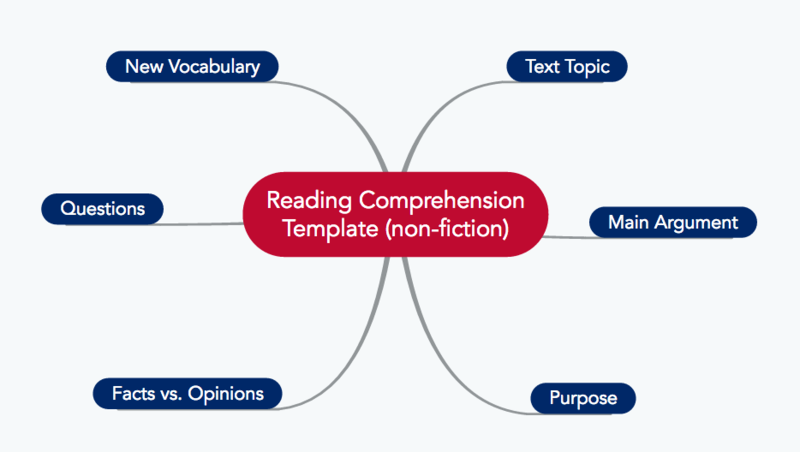 Ask students to compare their brain-dump to your map, adding keywords they may have left out and rearranging their topics to fit with your structure. 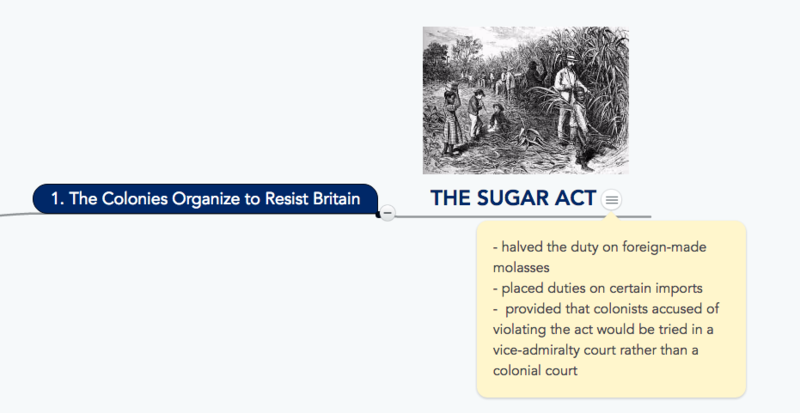 To finish this exercise, tell students what you will be discussing today, and show them how this new topic connects in with what was covered before. Ask them to add this new topic to the mind map in the appropriate place (either as a completely new branch, or as a sub-topic in an existing branch), and keep this mind map stored in their account. From now on, start all subsequent lessons with a 5 minute brain-dump, followed by a joint structuring session in this mind map. 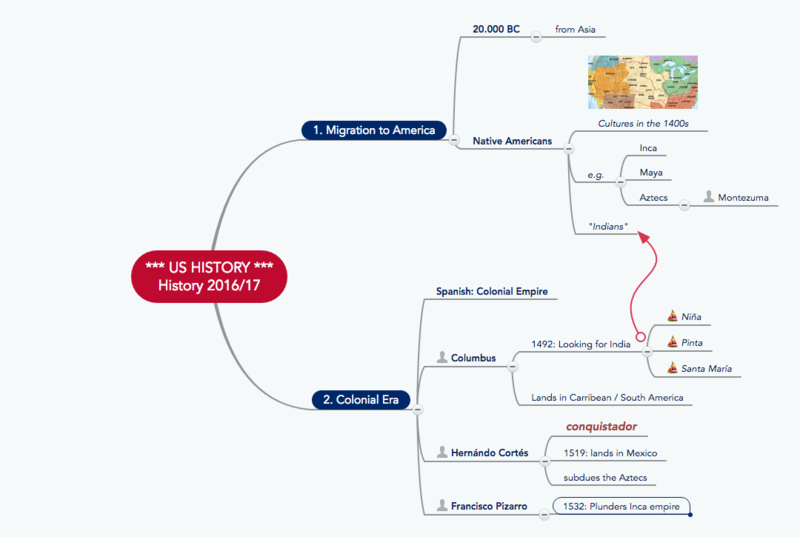 At the end of the year, the map will provide students with a great overview of the entire year’s material, which they can use to revise for the end-of-year exam. 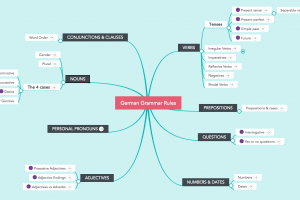 If the mind map gets too big to be useful, students can turn branches into individual maps. To do this, they have to right-click on a topic and select Tools > Create as Map from the dropdown menu. The topic they’ve chosen will become the root topic of the new mind map. Links between the old and new map will allow students to quickly jump back and forth between them. Mind maps aren’t just great for brain-dumps, they’re also fantastic presentation tools. They show how individual pieces of information are connected, and let students see the bigger picture. This helps them comprehend and retain information more easily. For you as the teacher, the benefits lie in the incredible speed with which mind map presentations can be created. So instead of spending a couple of hours preparing a PowerPoint show for your next lesson, create a simple mind map presentation—depending on the amount of content you want to show, you can probably do this in less than three minutes. 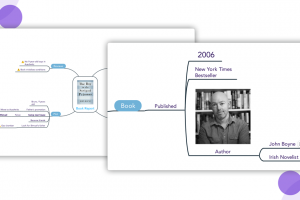 Open a new, blank mind map in MindMeister and write the subject of your presentation in the center of the map. Create branches for the different topics you will be talking about, starting at about 1 o’clock with the first one and going clock-wise around the center. Now add subtopics to the branches you’ve created. Be sure to stick to keywords or short phrases to keep the map simple and easy to view at a glance. To highlight individual topics and make the map more memorable as a whole, use plenty of colors, icons and images. You can also indicate relationships between topics using arrows. When you’re done, switch to MindMeister’s presentation mode by clicking on the presentation icon in the bottom left corner of the screen. Keep the CMD key (or CTRL key, if you’re on Windows) pressed while you click-drag slides over the topics in your map. 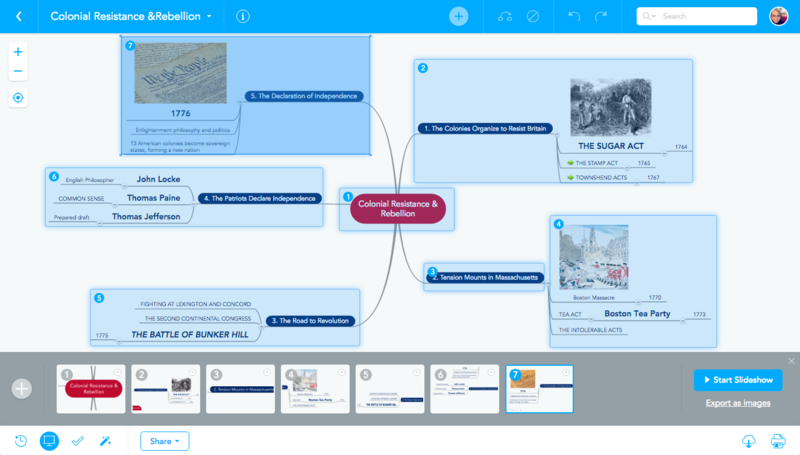 Slides can cover individual topics, entire branches, or the mind map as a whole. Before the lesson starts, export your mind map presentation as a .mind file and share it with your students—you can send it to them via email or for instance save it to your learning management system for them to download. 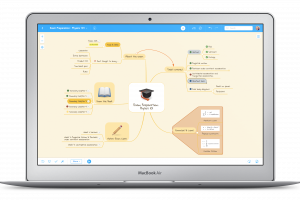 Here comes the best part: While you’re standing in front of the class, presenting the mind map and explaining everything in more detail, your students can upload the .mind file into their own MindMeister account and open their copy of the map. There, they can add their own, personal notes from the presentation, filling in details in the form of subtopics, notes, or comments. If there’s enough time, you can ask students to expand the presentation map either alone or in a group setting, adding their own ideas, opinions and questions. Group assignments are supposed to encourage collaboration between students and enhance the result by collecting input from more than one person. In most cases, however, one or two students will sacrifice themselves to do all the work, a few more may try to give at least some input, and the rest will just goof off and play with their phones. The use of a mind map can change that. Mind maps offer the possibility for multiple students to work on a shared canvas at the same time. In contrast to a bullet point list or note sheet, everyone can easily add their own nodes and keywords wherever they see fit. MindMeister provides each user with their own color signature when collaborating on a map. 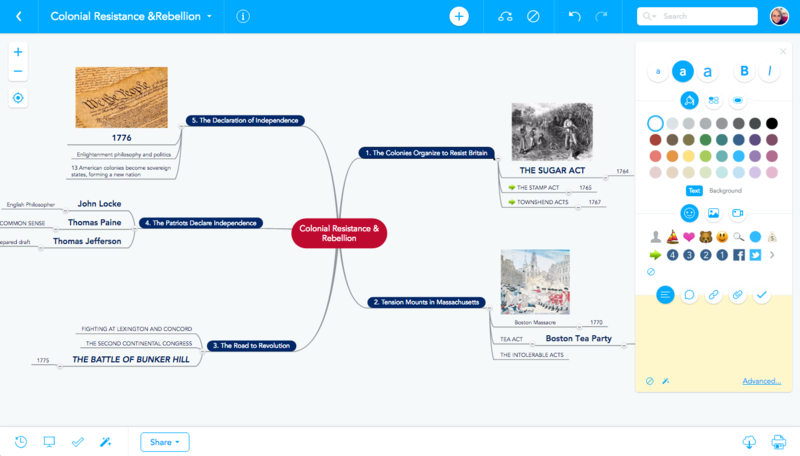 If your students are working on a shared mind map, you can always check who really contributed to it afterwards, using MindMeister’s History View. Divide the class into groups of 3-4 students. Ask each group to create a new mind map and share it with all of its members, so that each student can access it on their own device. Ask students a question that encourages them to think critically about a topic or source (e.g. a movie you’ve watched together) and give them 10 minutes time to brainstorm together, noting down all their thoughts and ideas in the map. After the brainstorming session, the students can then evaluate, vote on, and organize the ideas they’ve collected. Topics can easily be rearranged, grouped or removed. Spend the remaining time discussing the exercise, enabling students to share their insights and questions. You can also show students a short video clip to spark a discussion. Videos can easily be embedded in students’ mind maps. Taking notes in a mind map while reading a complicated text can help students break down the information into more manageable chunks; they are able to capture thoughts and questions that arise while they’re reading; and they can visualize connections between individual arguments and facts presented to them. 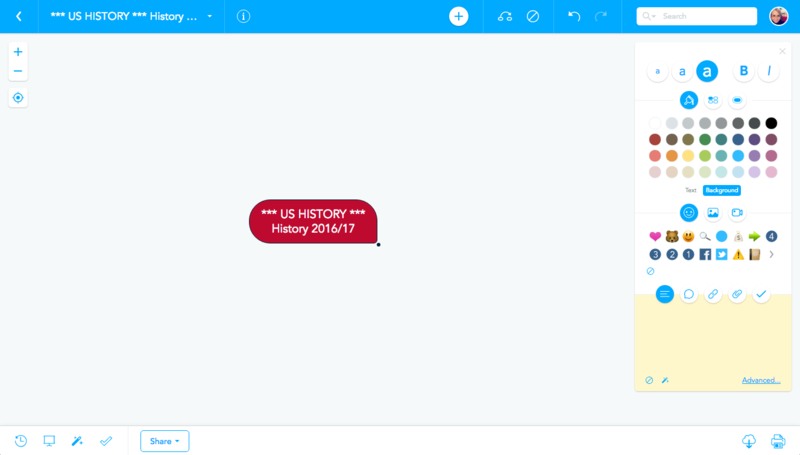 Since MindMeister is a web-based tool, your students can easily access their account from their home computer, tablet or even smartphone, and use it to take notes while they read an article or chapter in a book related to the material you’ve covered in class. Of course, the same principle can also be used to help students comprehend a complicated movie, documentary or play. When they’re done, students can either share their mind maps with you (via link or email), or discuss them in a group setting in class. So these are 4 teaching ideas you can use to foster collaboration, improve reading comprehension, and help your students memorize information long-term. Give them a try and let us know how it went!